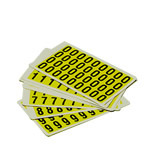 Easily applied peel-off labels can be removed cleanly if required. The most important part of running a warehouse is organising where all the products and materials are kept. 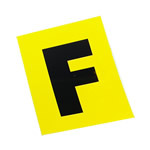 An efficient system of storage can save a huge amount of time and, therefore, money at every stage of the manufacturing and packing process, and even if only dispatching is performed, clear labelling and organisation are vital for a smoothly running warehouse with staff that can find everything that they need quickly and easily. Clearly labelled aisles and shelves will also help the delivery drivers to find the right place when they are directed into position, and allow new staff to become orientated quickly. 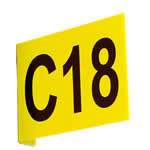 A system of numbers and letters generally works well when labelling and organising a warehouse and our prepared vinyl letters are ideal for this purpose, and prove especially useful in smaller storage areas. The special adhesive can also be removed easily with minimal residue. 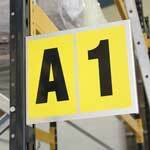 There is a choice of single letters or digits, as well as arrows in order to help to direct staff and visitors around the storage space. 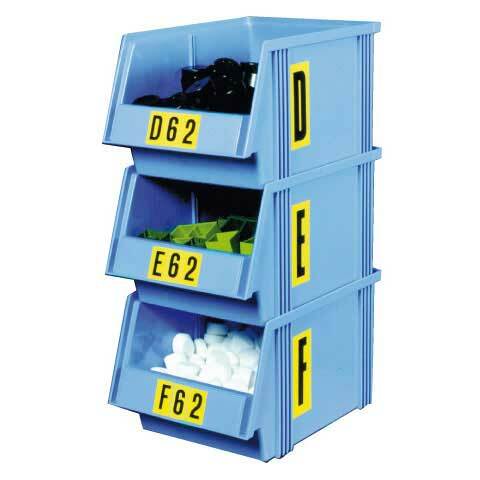 Efficient marking in a storage area or warehouse is vital to ensure that products are stored where they should be and that they can be easily located by anyone who needs them, whether they are dispatching goods or simply collecting materials to use. F5/ARROW - Good quality sticker. 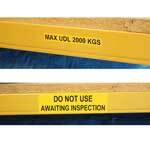 We use these for our warehouse shelving.